If you have access to each side of your bar molding, bar mount brackets are a great option for both a classy look and an added level of convenience. This outdoor-friendly Matte Black bracket, along with 2" metal tubing and other matching components, is a luxurious, convenient addition to any home or commercial bar. The durable black finish of this bar bracket will precisely match your Matte Black two-inch outside diameter bar rail tubing. Bar mount brackets include a back access bolt to allow for weight bearing on the bar rail. To install the bar rail bracket, you will need to use a screwdriver to attach the 3 mounting screws on the front end of the bar facing, and the nut and bolt assembly on the back end of the bar. The set screw goes into the hole where the bracket holds the tube and is screwed into the bar rail tubing. The black powder coating is a bit thick and needed to be sanded down at the 90 degree corner piece to fit together. Otherwise these performed and look great! Some pieces in black needed to be sanded to fit together but otherwise perform and look great! Well made and holds the black finish fairly well. We have concrete floors and need to have side mount brackets on our bar. 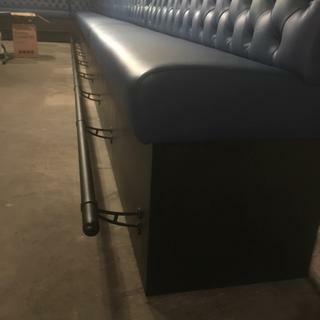 They are great brackets for the booths we make! Standard size for our customers. what is the tightesss radius 2" tubing can be bent too? Need 17". BEST ANSWER: Hi James, a radius of 17" should be possible for this product but may take longer to turnaround. Our bar rail sales team experts will be your best source for custom bend projects. Give them a call at 866-279-2337! Cheers! it depends on the material. Don't bend painted metal. It should be raw until final shape. Hope this helps.